Reduced administrative time setting up, paying, and tracking accounts. Streamlined processes for ordering, bill payment, and accounting. But that’s not all. Here are 5 reasons why Josef Gas is the only provider of welding supplies Mississauga businesses need. Josef Gas has a long history in welding, dating all the way back to 1969 when our founder Joe Stangl started his first welding supply business. Today, we have Joe and his son Richard at the helm. They both still work closely with clients to provide a truly hands-on approach to service delivery. Not only that, all of our sales reps have a strong background in welding and we have 4 staff members who have formal schooling in welding technologies. We are truly committed to your success and will draw on all our resources to help your business succeed! We said we were a one-stop-shop and we mean it. You need three things for a successful welding operation: Welding Gas, Welding Equipment, and Welding Wires – and we have all three and more welding supplies in Mississauga! There’s no need to run around trying to find all the different pieces you need. You can even re-stock your welding supplies when you re-order your gas and we’ll deliver it all right to your door. With just one call you can truly have it all! Naturally, one of a business’ biggest concerns is the cost differential between Josef Gas and other suppliers. As an Authorized Distributor for all of the major brands we can offer very competitive pricing. If you’re buying gas from us, we have long standing relationships with gas suppliers, which allow us to pass cost-savings on to our customers. You read that right. We have a 3-acre facility in Concord complete with a showroom where you can see our products in person, pick the brains of our sales and welding staff, or just hang out and have a cup of coffee with our owners! If you are ready to say goodbye to multiple vendors, the headaches of multiple billing, and a lack of support, contact Josef Gas today. We are a family-run welding supplier that can provide you with all the benefits of big-company services with a small-company customer service experience. 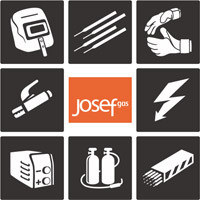 Call 416.658.1212 or email info@josefgases.com to get started today. We promise you won’t regret it!